A few years ago, while covering a Breitbart party at the annual Conservative Political Action Conference, I introduced myself as a reporter to Dog the Bounty Hunter. Immediately, and without warning, he ran his fingers through my hair and said, “You’ve got some beautiful hair.” I was at first stunned, and then angry, and then frustrated with my inability to express that I was angry. I wrote about it at Jezebel (as did New York Magazine), dismissed it as a part of the bizarro-world nightmare that is reporting on conservative spectacle, and moved on. None of this is exactly revelatory. Biden’s a-little-too-close, too familiar behavior has been long documented, but ultimately dismissed, as Joe just being Joe. Biden’s response to Flores’s allegation was respectful, but noncommittal. “We have arrived at an important time when women feel that they can and should relate their experiences, and men should pay attention, and I will,” he said in a statement. “That’s who Joe Biden is—a warm, generous individual who believes its on all of us to pay attention to women’s stories and experiences,” she continued. Our political and justice system is poorly equipped to handle what Flores is asking for: difficult conversations about men’s sense of entitlement to women’s bodies, even in non-sexual contexts. The systems deal with binaries: guilty or innocent, good or bad, right or wrong. Flores is asking for an acknowledgement and reckoning with the creepy, unwanted behavior that falls somewhere in the middle, in which political leaders like Biden adopt higher standards of personal and professional conduct that go beyond whether behavior is criminal or not. 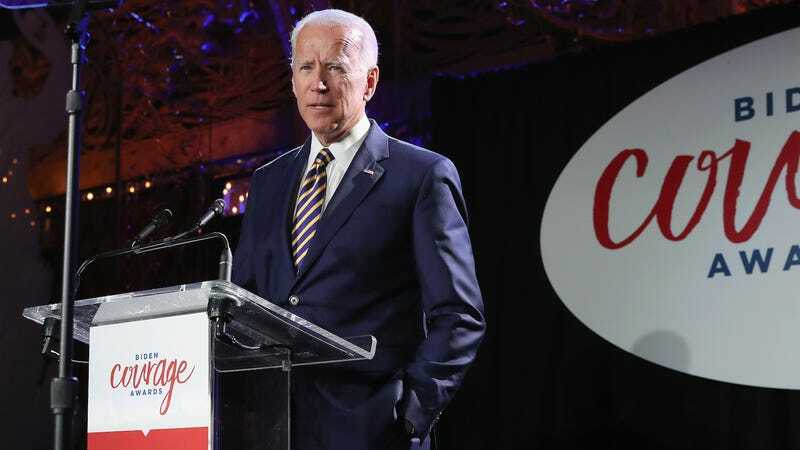 The question is not whether Biden should disappear from public life and end his presidential bid, or whether Biden is a really good guy to most women most of the time. Instead, Flores and Lappos are asking for an acknowledgement of conduct that doesn’t rise to the level of sexual assault, but is nevertheless demeaning, diminishing, and commonplace. To ignore them, or bog their stories down in a reactionary, bad faith interpretation of what these women have asked for—no one is advocating excommunicating Joe Biden, here—misses the bigger point: that we live in a culture which routinely values men’s intentions over women’s experiences, and here’s another small way in which that happens. There’s an easy fix for the problem Flores raises, and it’s not solved by getting rid of Biden. It’s solved by acknowledging, collectively, that Biden should do better, and the women around him deserve that.